The Law School Admissions Council recently shared that LSATs administered increased significantly year-over-year: a 19.8% increase. In historical terms, the June 2017 test had more test-takers than any June since 2010, which had a whopping 23,973 (the last year of the "boom" cycle for law school admissions). That's good news for law schools looking to fill their classes with more students, and, hopefully, more qualified students. 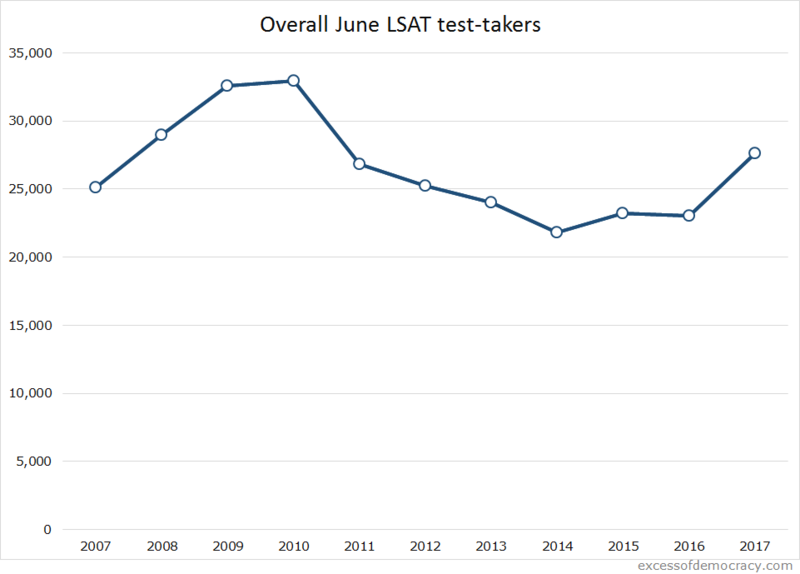 I've visualized the last decade of June LSAT administrations below. Of course, there are many more steps along the way to a better Class of 2021: applicant quality among those test-takers, whether they turn into actual applicants, etc. And given the potential for schools to accept the GRE instead of the LSAT, LSAT administrations may slightly understate expectations for future applicants. But one data point is worth consider, and that's repeat test-takers. LSAC discloses that data in some more opaque ways, but it's worth considering how many first-time test-takers were among the June 2017 test-takers. First-time test-takers are a better picture of the likely changes to the quality and quantity of the applicant pool. Repeaters are permitted to use their highest score, which is a worse indicator of their quality. (They may now retake the test an unlimited number of times.) Additionally, first-time test-takers represent truly potentially new applicants, as opposed to repeaters who were probably already inclined to apply (or perhaps have applied and are seeking better scholarship offers). Repeat test-takers have been slowly on the rise, as the graphic above (barely!) demonstrates. First-time test-takers made up 84.9% of the June 2007 LSAT administration. That number has eroded every June since, and this June saw first-time test-takers make up 74% of the administration. About 27,600 took the test, and 20,430 for the first time; compare that to June 2011, when there were fewer test-takers (about 26,800), but more who took it for the first time (21,610). There is some good optimism for law schools looking for a boost in their admissions figures. But there's also a little perspective to consider about what these figures actually represent.